Accent your home with this stylish chair. The uniquely-shaped wing back includes tufting that adds a regal feel and transforms a room from ordinary to outstanding. Curved arms and dark, tapered wood legs bring a calming, fluid motion to the piece. Meanwhile, the boxed seat cushion is made from the highest quality foam, so this chair will sit like a dream for years to come. 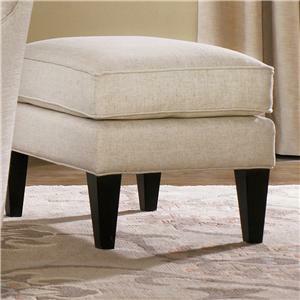 For a complete look, pair with the matching ottoman. The 502 Style Group Wing Back Chair with Tufting and Wood Tapered Legs by Smith Brothers at Wayside Furniture in the Akron, Cleveland, Canton, Medina, Youngstown, Ohio area. Product availability may vary. Contact us for the most current availability on this product. The 502 Style Group collection is a great option if you are looking for Transitional furniture in the Akron, Cleveland, Canton, Medina, Youngstown, Ohio area. Browse other items in the 502 Style Group collection from Wayside Furniture in the Akron, Cleveland, Canton, Medina, Youngstown, Ohio area.